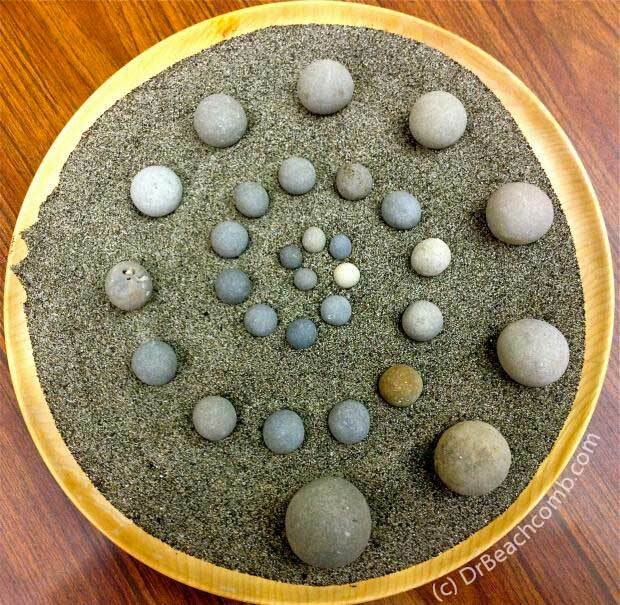 Going through her beachcombing treasures, anthropologist Deacon Ritterbush, aka Dr. Beachcomb, found and arranged these beautifully rounded beach stones into a zen-like spiral in sand. For me it inspires peace and makes for a wonderful meditation focus. It also inspires me to go treasure hunting at the beach! …my beachcombing experience spans over six decades. I have explored coastlines from Chesapeake Bay and Puget Sound to the United Kingdom, Mediteranean, Caribbean and throughout the South Pacific, with wonderful memories and beach treasures to show for it. Because I believe that “context” leads to a greater appreciation of everything, I draw on my research skills and anthropology background to learn more about the artifacts I find. This leads me on even more “combing expeditions,” this time for facts on the evolution of our planet and the splitting of Pangia; Chumash Indian tool-making; 17th c pirate hide-outs in the Caribbean; the impact of acidification on mollusks; and much more. View more of her fascinating finds via her Treasures page.